Effective July 2000, the Maryland Electric Customer Choice and Competition Act of 1999 restructured the electric utility industry to allow Maryland businesses and residents to shop for power from suppliers other than their franchised electric utilities. Prior to restructuring, the local electric utility, operating as a regulated, franchised monopoly, supplied electricity to all end-use customers within its franchised service area under bundled service rates. These rates included the three principal components of electric power service: generation, transmission, and distribution. Under retail competition, electricity suppliers purchase electricity on the wholesale market for resale to electricity consumers. Consumers may choose any supplier with a license to sell electricity in Maryland. Those consumers who do not select a supplier or are unable to receive service from a competitive supplier are provided with electricity service by their regulated utility, which contracts with wholesale suppliers on behalf of its consumers, under the supervision and guidance of the PSC. This appendix provides a background on electricity markets and the influence of markets, technology, fuel, and environmental regulations on the retail prices paid by end-use consumers. The majority of electricity sales and purchases that occur in the wholesale market of the PJM RTO are bilateral transactions, wherein two entities negotiate a contract for the sale and purchase of electricity according to the terms established in a contract. These bilateral contracts may be the result of a competitive solicitation or a privately negotiated power purchase agreement (PPA), the details of which are typically kept confidential. Entities seeking to buy and/or sell electricity might also look to one or more of the regional markets and trading platforms. Electricity trades can be categorized according to two main classes: physical trading and financial trading. In physical trading, the electricity supply is balanced against demand and price is established at the point where the highest offer for electricity (supply) meets the lowest bid for electricity (demand) so that the load requirements are met. Physical trades can be determined in advance of trading (e.g., participation in day-ahead markets) or after trading (e.g., imbalance markets and ancillary services). The primary purpose of financial trading is to protect against expected price volatility and to provide price discovery for purposes of evaluating future supply contracts. However, power marketers and traders can also use electricity futures contracts to obtain physical electricity at the hub. This delivery potential helps to validate the futures prices. Financial trading is conducted through a financial market or exchange such as the Intercontinental Exchange (ICE) or the New York Mercantile Exchange (NYMEX) according to the specifications determined by the commodity exchange. The electricity supply markets in PJM’s wholesale electric market consist of four separately organized units, defined in greater detail as: two markets for the sale or purchase of energy (the Day-Ahead and Real-Time Markets); and two markets designed to support the various services required to keep the electricity system functioning (the Capacity Market and the Ancillary Services Market). These markets are competitive and suppliers and buyers submit bids and offers. Except for a small number of ancillary services that are provided at cost-based rates, the prices for electricity, capacity, and ancillary services are set through the balancing of supply and demand. The four different wholesale markets are discussed in detail below. Two separate PJM markets exist for the daily buying and selling of electricity. These are the Day-Ahead Market and the Real-Time Market. These markets operate on the basis of locational marginal prices (LMPs)electricity prices that vary by time and geographic location. Sellers include those entities offering electricity supply such as generation companies, agents who may have contracts with generators, curtailment service providers (or demand response providers) who offer to reduce load on demand (a form of negative supply that serves to balance supply and demand as effectively as additional generation), and brokers. Buyers consist of those needing electricity, which can include brokers and companies termed “load serving entities” (LSEs). An LSE is any supplier, including regulated utilities providing standard offer service or default service, which is responsible for the sale of electricity to a retail customer. Along with electricity, LSEs must also purchase their proportionate share of the PJM system’s peak capacity (to ensure reliability) and transmission services (to move the electricity from the generator to the distribution system). The Day-Ahead Market is a spot market (deliveries are expected in a month or less at that day’s quoted price) in which participants can purchase and sell energy for the next operating day. It provides the opportunity for buyers and sellers to request short-term energy and transmission services to meet electricity needs. Hourly LMPs are calculated by PJM for the next operating day based on generation offers and demand bids. PJM then matches bids and offers and sets the price for the Day-Ahead Market, creating a financially binding day-ahead schedule based on the known electric deliveries and corresponding hourly prices for a specific hour and location. Each supplier in PJM submits hourly supply schedules specifying the amounts of generation at various prices it would be willing to supply. PJM arrays these bids from lowest to highest price, adjusting each price to reflect incremental system losses. Incremental losses are specific to each generation bus and reflect the impact on total system losses of an increase in generation. The price bid submitted by the last generating unit required to meet demand (the marginal unit) becomes the hourly dispatch rate. PJM then computes hourly LMPs by adjusting dispatch rates to include the effect of congestion. Congestion is also location-specific and reflects the manner in which PJM must resolve transmission constraints to serve load at various locations on the grid. If the transmission interface with PJM West is constrained, for example, PJM may have to order the dispatch of generating units elsewhere in PJM, out of economic merit order, in order to supply load in the east. The Real-Time Market acts as the balancing market between what was scheduled through the Day-Ahead Market and bilateral transactions, and what is required to meet real-time energy needs. This is a spot market in which LMPs for each zone are calculated at five-minute intervals based on actual electricity grid operating conditions. Transactions are settled hourly. LSEs pay the real-time LMP for any demand that exceeds their day-ahead scheduled quantities. In cases where an LSE uses less energy than it purchased in the day-ahead market, the LSE can sell that excess energy back into the real-time market and receive revenues for it. Generators are paid real-time LMPs for any generation that exceeds their day-ahead scheduled quantities since it gets sold at the real-time price into the market. Generators also must pay the real-time LMP for generation deviations below their scheduled quantities since the electricity they had promised to supply must now be supplied by other generators who need to be compensated. PJM tracks the supply and demand of each market participant and assigns costs and revenues accordingly, on an hourly basis. Capacity refers to the amount of electricity generation available at any given time. The capacity market is a forward market in which LSEs purchase supply-side and demand-side capacity resources. Each LSE is required to have available its share of the PJM system peak plus a planning reserve margin of an additional (approximate) 15 percent of peak load. This means that the system as a whole must always have more generation capacity available than what is expected to be required to meet peak loads so that extra electricity generation can be brought into use if needed, e.g., in the event of an unplanned outage of one or more large generating plants or extreme weather conditions. The current PJM capacity market is based on PJM’s Reliability Pricing Model (RPM), implemented in 2007 as a means to provide power plant developers with price signals to influence decisions on whether (and where) to construct new power plants and to provide owners of existing generation with price signals to influence decisions on whether to retire existing plants. The RPM is an approach developed by PJM and used to provide a market price for capacity that is aligned with PJM’s assessment of the cost of new entry (CONE), i.e., the level of revenue that a power plant developer would require in order to make the decision to develop peaking resources economically feasible. The approach also recognizes and accommodates higher capacity prices when PJM is capacity short and lower prices when excess capacity exists. Fundamentally, the market clearing price is determined through the intersection of a demand curve and a supply curve. 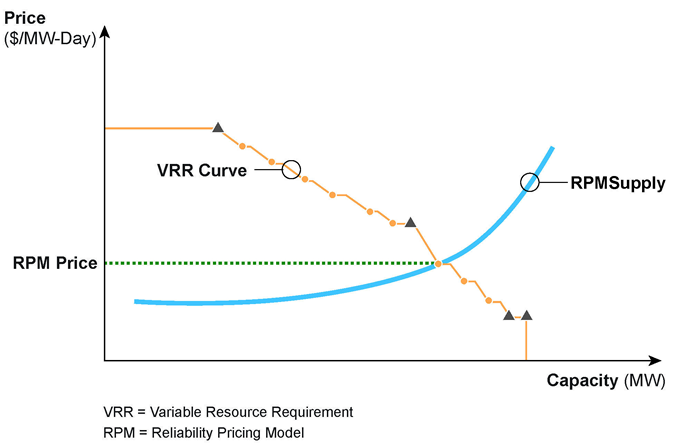 The Demand Curve – the downward-sloping demand curve, referred to by PJM as the Variable Resource Requirement (VRR), is developed for the PJM region and also for the locational delivery areas (LDAs). This curve is plotted on a graph with dollars per MW-day on the vertical axis and MW of capacity (or percentage of reliability requirement) on the horizontal axis. The Supply Curve – the supply curve is obtained by PJM through the capacity bids offered by the capacity owners. Eligible capacity includes existing and new capacity, demand-side resources (e.g., load response), and qualified transmission upgrades. The capacity offers from the auction are stacked (lowest cost to highest cost), resulting in an upward-sloping supply curve. The auction clearing price is determined by the intersection of the VRR and the supply curve (the auction bids). PJM conducts a Base Residual Auction (BRA) to obtain committed capacity for LSEs that have not opted for the Firm Resource Requirement (FRR) alternative. The BRA is conducted three years in advance of the year for which the capacity will be committed (e.g., the BRA for the planning year June 2013 through May 2014 was held in May 2010). The BRA process determines the market clearing quantity and price for capacity for PJM as a whole and for each LDA based on the intersection of the demand and supply curves. The capacity resources that clear the BRA receive the market-clearing price and assume the obligation to provide capacity in the relevant planning year. In the event that a party fails to meet its capacity commitment, PJM can impose significant penalties. PJM may conduct “incremental auctions” following the BRA. The purpose of the incremental auctions is to allow cleared resources in the BRA to adjust the capacity quantities bid (for example, for planned resources that may not become available in the quantities expected or for unanticipated additional quantities). Additionally, PJM can use the incremental auction option to secure additional capacity if the peak load forecast is increased. Since the introduction of the RPM capacity market, the price for capacity has increased significantly throughout the PJM region. 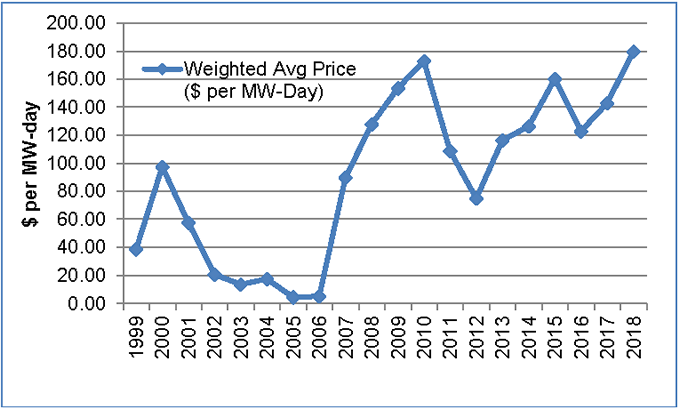 Figure B-2 shows historical capacity prices along with RPM prices out to 2015 arising from the PJM auctions. Source: Monitoring Analytics, 2015 State of the Market Report for PJM. Ancillary services are all the services necessary to support the transfer of energy from generation resources to end-users or load, while maintaining the integrity of the transmission system. Ancillary services include: scheduling, system control, and dispatch; reactive supply and voltage control; regulation and frequency response; energy imbalance; and operating reserves. Costs for ancillary services are recovered from a combination of market-based and cost-based pricing cleared or set by PJM. Market-based services set prices through auctions, such as generators bidding to offer regulation and/or operating reserve energy. Cost-based services are provided by PJM and billed to participants according to a set rate based on revenue requirements. An important element of PJM’s ancillary services is regulation. Regulation service matches generation with short-term changes in load, maintaining desired frequency and voltage by increasing or decreasing the output of selected generators, load response units, or electricity storage systems as needed via automated control signals. Longer-term deviations from scheduled load are met by the operating reserves and generator responses to economic signals. PJM’s regulating requirement is 525 effective MW during off-peak hours (midnight to 4:59 p.m.) and 700 effective MW during on-peak hours (5:00 p.m. – 11:59 p.m.). The PJM regulation market accepts bids from generators and fast-responding load resources and electricity storage systems. These entities enter an offer price for each hour and, if called upon, are paid the hourly market clearing price for regulation service. Operating reserves represent the generating capability that is standing by ready for service in the event of a disruption on the power system, such as the loss of a generator. These operating reserves, the standby generation made available to serve load in case there is an unplanned event, are not the same as the 15 percent planning reserve requirement, which is an annual capacity obligation based on PJM’s independent load forecast and other system planning assumptions and scenarios. The 15 percent annual planning reserve requirement refers to the overall amount of extra capacity that must be maintained in the PJM system as a whole in order to keep the probability of a loss of load event below a specified level. In other words, the PJM system must always maintain a condition where overall generation ability exceeds peak demand by 15 percent. The operating reserves refer to the amount of generation kept in standby mode as part of daily system operations so it can be called upon in case of an emergency, such as a major generation unit tripping offline. Operating reserves can include both supply-side resources, i.e., power plants, and demand-side resources such as end-users participating in load management or load curtailment programs who can quickly reduce the amount of electricity they are using when called upon to do so. Primary reserves are those resources available within ten minutes of a request by PJM. Secondary reserves must be available within 30 minutes of a request. Synchronized or spinning reserves are typically the first primary resources called upon and are paid to be available, whether called upon to respond to an event or not. These are the reserve units that are either already running but idling in standby mode, or can be started up very quickly and synchronized with the grid, and can therefore supply energy within the 10-minute timeframe. The PJM region is divided into different zones (shown in Figure B-3), organized primarily according to the service territories (or aggregations of two or more service territories) of the distribution utilities. PJM tracks the demand and supply of electricity within each zone. The spot market price of electricity is based on the supply and demand for electricity for that time of day in that area. Depending upon local conditions, the price for electricity can be very different from zone to zone for the same time of the day. The disparity of prices from zone to zone is largely attributable to the ability, or inability, to transmit electricity from one zone to another. The transfer of electricity between zones is sometimes limited by the size or capacity of the transmission system. For a system not constrained by transmission grid limitations, conditions in all zones would be the same at all times and the marginal prices would be equal in all areas at any given time. However, in the wholesale electricity market, LMPs vary because of physical system limitations, congestion, and loss factors. This transmission congestion can have a significant impact on the price of electricity in the wholesale markets. Generators selling electricity in a zone with transmission congestion may be able to obtain higher prices than a generator with comparable operating costs located in a zone that is not subject to transmission congestion. LMPs, as established at each zone, can be summarized according to time of day; peak hours are Monday through Friday (except holidays) from 7:00 a.m. to 11:00 p.m.; off-peak hours are the remaining evening, weekend, and holiday hours. Table B-1 provides the PJM average and median prices experienced over the 2015 calendar year. Operating costs and other factors contribute to the bid prices offered by generators and the resulting overall annual average LMP. 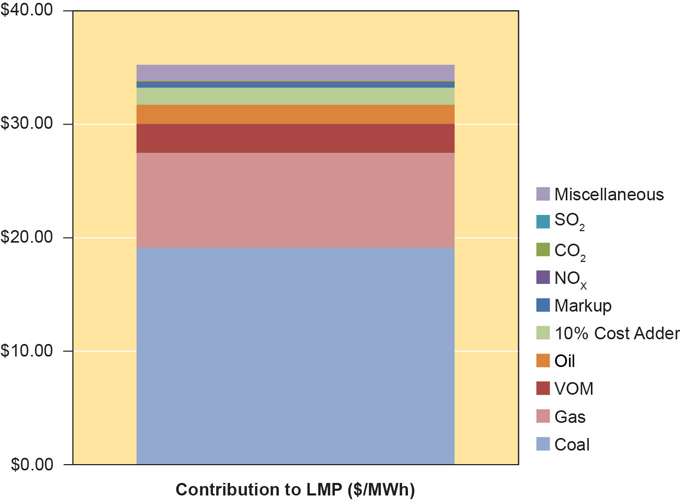 Fuel costs make up the largest share of generator operating costs and therefore contribute most to the bid price and hence LMP (see Figure B-4). The PJM Market Monitor calculates the factors contributing to annual average LMP based on the weighted average of the factors influencing the generator bid prices at specific locations. This weighted average considers both on- and off-peak prices, and which plants are operating on the margin in which conditions. In 2015, the capital and fuel supply costs of coal-fired generators made up 43 percent of the annual average LMP, while gas-fired generators made up 27 percent. Variable operating and maintenance costs (VOM) contributed 7 percent of the LMP and PJM’s Cost Adder contributed 8 percent overall. PJM allows generators to add a 10 percent cost adder to their bids to account for the uncertainty in the process of defining costs. In addition, the cost adder provides protection against unintended understatement of variable operating costs, which could be harmful to reliable grid operation because it could create an incentive for generators to restrict their generation offer parameters. Besides fuel costs, other factors contributing to price levels include environmental costs (such as cost of controls and emission allowances), non-fuel operating costs, and profit margins. Cost for compliance with CO2, NOX, and SO2 emissions regulations contributed approximately 2 percent to the total LMP. All generators, however, are paid the LMP in their zone; the PJM Market Monitor estimates these cost factors for informational purposes only. Average annual LMPs in PJM rose from the late 1990s to the late 2000s, more than doubling from 1998 to 2008 (see Table B-2). During the last decade, a large portion of the constructed new generating capacity has been natural gas-fired. 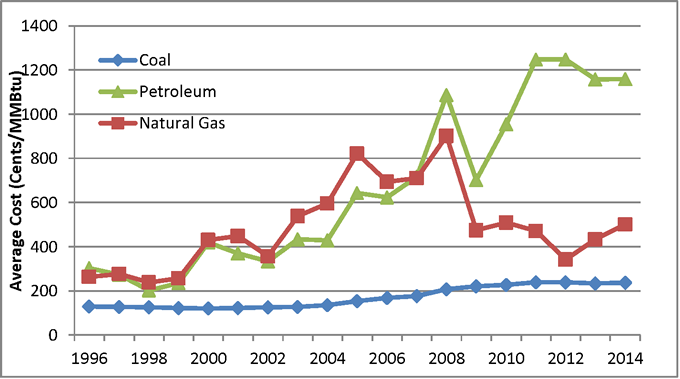 Natural gas and petroleum prices tripled between 1998 and 2008. Due to the nature of the commodity markets and short-term supply contracts, these price increases were quickly reflected in electricity generation bid prices. LMPs in 2009 and 2010 were much lower than in 2008, however, due mainly to reduced electricity demand as a result of the recession. In 2011 and 2012, LMPs were once again significantly lower than in 2008, and in 2012, LMPs were the lowest since 2002. After a slight uptick in 2013 and a sharp increase in 2014, LMPs once again fell back to their 2012 levels in 2015. This can be largely attributed to the low cost of natural gas. Natural gas prices have declined since the highs reached in 2008. Along with the lack of load growth since the Great Recession, due mostly to a weak economic recovery from the recession as well as increased penetration of energy efficiency and behind-the-meter renewable energy projects, this decline in the cost of natural gas has put downward pressure on market prices for electric power. Figure B-5 depicts fuel costs for electricity suppliers between 1996 and 2014. The cost of uranium fuel (not shown in Figure B-5) is only a small part of the overall operating and maintenance cost for a nuclear facility. However, the price of uranium has increased over the last decade, rising from a weighted average of $12.61 per pound in 2004 to $55.64 per pound in 2011, then dropping to $46.16 per pound in 2014. A pound of uranium provides approximately 171 MMBtu; therefore, the cost to the electric power industry was approximately 27 cents per MMBtu in 2014. While the cost of uranium fuel does have a small impact on operating costs, it has little to no influence on the dispatching of a nuclear facility since they are a base load power source. The dispatcher must at all times respect the physical limitations of the transmission system, including thermal limits, voltage limits, and the need for the system to maintain equilibrium. These limitations sometimes prevent the use of the next least-cost generator, instead causing the dispatch of a higher-cost generator located closer to the load in lieu of a lower-cost generator located at a greater distance from the load. LMP differentials caused by transmission system limitations between zones are referred to as congestion. 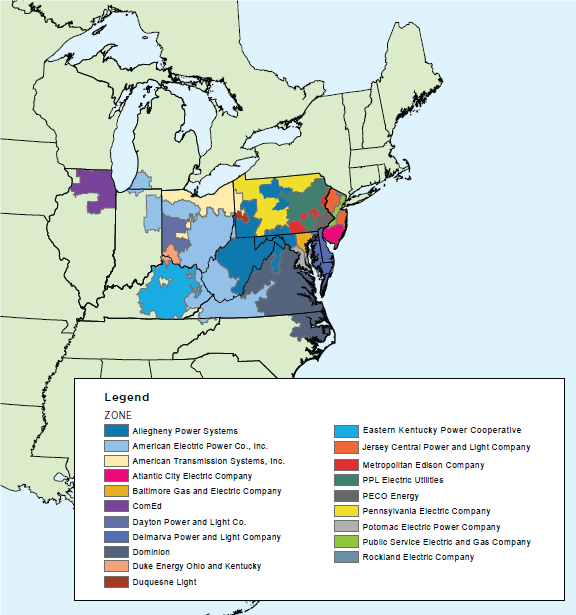 The PJM system is divided into three regions  Western, Mid-Atlantic, and Southern Regions. LMP differentials between regions are mainly due to congestion between the Western Region, where abundant low-cost generation is located, and the Mid-Atlantic Region, in which the major load centers are located, which can lead to different electricity prices in the transmission zones that comprise PJM (see Table B-3). As seen below in Table B-3, the differences in LMPs in 2015 between the Western Region and Mid-Atlantic Region decreased compared to the differences in LMPs between the Western Region and Mid-Atlantic Region in 2014. This can be attributed to lower amounts of congestion in 2015 than in 2014. PJM reported a 28 percent decrease in total congestion costs in 2015 compared to 2014. In Table B-3, the PJM zones that impact Maryland are highlighted in brown. Additional information on congestion is provided in Chapter 2 of this CEIR. The term “ancillary services” refers to a suite of services necessary for the reliable generation and delivery of power and includes such services as reactive supply and voltage control, scheduling, and operating reserves. A more detailed discussion of ancillary services is provided later in this appendix. PJM divides the PJM region into deliverability areas based on transmission connections and constraints. Certain LSEs (utilities, electric cooperatives, or municipal utilities) may opt to commit capacity to meet peak demand plus the reserve requirement on a firm basis for a minimum five-year period subject to PJM approval.